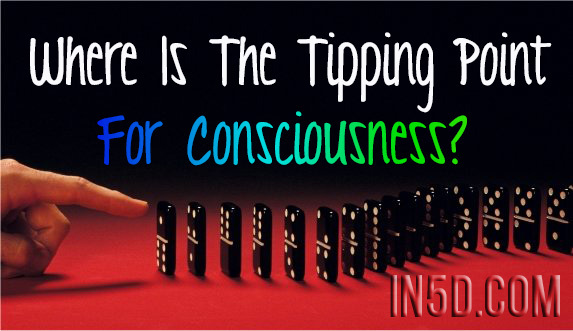 Where Is The Tipping Point For Consciousness? A funny thing happened on the way to cosmic mind. There was a vision of it that captivated some of the greatest thinkers in the last century, but then the vision faded. In the current atmosphere of science, the notion of a conscious universe has been marginalized — you won’t see it mentioned in Nova programs. Mindless materialism reigns among the stars and subatomic particles. We are back to a tightly enforced prejudice that is depressing considering that the most hallowed names among quantum pioneers, including Einstein, Bohr, Heisenberg, and Schrödinger, took the possibility of cosmic mind seriously, and all but Einstein ultimately embraced it. Why did we slip backward, and where do we go from here? A sizable cadre of younger physicists are asking these questions, but as science circles back to questions that were already answered a century ago, the whole focus may be wrong-headed. Facing a wall of resistance from mainstream science, perhaps we need to look elsewhere. If consciousness is going to reach a tipping point, it seems obvious that science isn’t going to generate it. Only people will, out in the world living everyday lives. Populism makes intellectuals quite nervous — often with good reason — but it wasn’t intellectuals who gave us democracy, spirituality, art, and music. The human condition is influenced far more by a rising tide of collective change. Democracy needed to reach a turning point in order to become a given notion accepted by the majority of the human race. How can this happen with consciousness? 1. Unconscious actions — These are ruled by habit, biases, hidden beliefs, received opinion, and group thought, which intimidates and overrides individual thought. 2. Conscious actions — These occur when we take the influences just mentioned — the whole mental apparatus that makes people unconscious — and push them out of the way. A conscious act involves actually seeing the situation for what it is and shaping reality around direct experience. 3. Higher consciousness — This is the state where actions are motivated by inspiration, insight, spiritual awakening, sudden breakthroughs, and creativity. It’s a controversial aspect of the human mind, with dogmatic deniers on one side and the dogmatically religious on the other. In the course of history, higher consciousness has played a huge role, and inspired teachers like Jesus and Buddha wanted to see society reconstructed so that the most awakened and self-aware states became the norm. This didn’t occur, and it would appear, if you are a dry-eyed realist, that it will never appear until the human race reaches a tipping point with the previous state — before higher consciousness, there must be consciousness. The present moment is testing this hypothesis with mounting pressure. As climate change brings crisis and threat closer to everyone’s doorstep, we will be saved only by becoming conscious. Mass denial, stupidity, political resistance, selfishness, and us-vs-them thinking belong to the zone of unconscious actions. Thanks to the ecological disaster that looms over us, we can no longer afford to indulge in them. We’re still indulging, however, because it is very slow work to get people to abandon the comfort of unconsciousness. Once you are conscious, that comfort is seen for what it is, a fool’s paradise. Enough people are conscious in every country that one can be optimistic about reaching a tipping point. The two biggest producers of greenhouse gases, the United States and China, are frustrating to observe, because they are rich enough to solve the problem but are also mired in the false comfort of unconscious attitudes. Different as the two societies are, as alien as one political system appears to the other, Chimerica, as the economist Niall Ferguson dubbed it, must rise to consciousness before the rest of the world can be rescued from catastrophe. After that tipping point is reached — no one can predict was massive disaster will finally make the difference — then the far-reaching implications of consciousness, including cosmic mind, will inevitably be uncovered. Tags: buddha, Deepak Chopra, einstein, higher consciousness, Jesus, tipping point, Where Is The Tipping Point For Consciousness?